A key part of this AR Blue Clean AR142P review is PSI. Each power washer will be rated by PSI. This number dictates the power that will be available to remove tough dirt. Most residential units will contain PSI that ranges between 1300 and 2600. This AR Clean AR142P review must explain that the unit provides 1600 PSI. This is appropriate to complete cleaning tasks around the home. If you need higher PSI pressure wahsher, you can check AR383 review here. GPM, or gallons per minute, measures the water that will be used when the unit is set at a certain pressure. It is essential to explain here that this machine gives 1.35 GPM. An important part of this review is the provided cleaning units. This number can be found by multiplying water flow by water pressure. This amount will show how efficient a pressure washer will be at taking away tough dirt. This review must specify that the machine supplies 2160 cleaning units. This pressure washer has an Annovi Reverberi pump. This manufacturer is one of the largest privately owned companies that makes triplex pumps. This unit has a 3 axial piston wobble plate pump. This means that the machine will be efficient and provide years of use. A power washer will either run on electricity or gas. This AR Blue Clean AR142P review must state that this machine has an electric start. This will bring numerous advantages. For example, electric powered washers usually are less costly and smaller than other units. Since there is no exhaust, there are no dangerous fumes to worry about. This means that the units can be utilized in enclosed spaces where ventilation is limited. This review must discuss how long the pressure hose will be. This unit comes with a 20 foot hose to reach different areas. It also provides leeway around an area without needing to move the unit during various cleaning tasks. 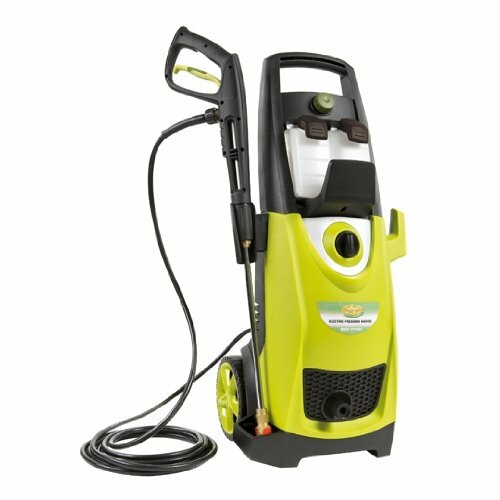 The spray is an important feature of any pressure washer. 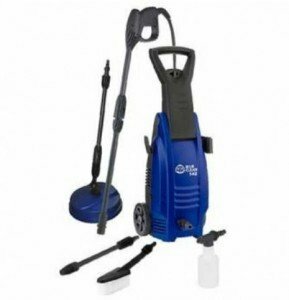 It must be stated in this review that the unit has a high pressure hose and adjustable nozzle. This allows a person to go from a pencil flow to a fan jet setting in seconds. This will be a convenient way to complete different cleaning tasks. 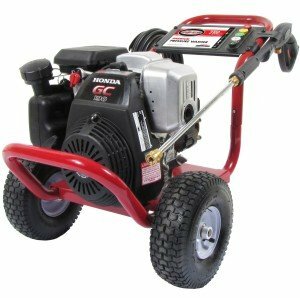 This pressure washer is extremely portable and light. This makes it easy to carry around from job to job. It weighs approximately 12 1/2 pounds. To make things even more convenient, it includes wheels. There are quite a few features to list here. To begin, there is a total stop system, which is controlled by the trigger gun. This allows for an automatic start and stop. There is also a safety lock to prevent the trigger from accidentally turning on when not in use. The 35 foot cord is quite long, so the unit will not need to be moved to different outlet once the machine is cleaning. The compact design is easy to store and transport. Finally, the one quarter inch hose diameter will allow for plenty of pressure to remove tough grime. When a person reads this AR Blue Clean AR142P review, it is important to understand the included accessories. There is a turbo lance, which provides ultimate power and a 10 inch patio cleaner. This makes cleaning a large area much easier. Finally, there is a fixed brush attachment that will scrub away grime without effort. It is important to run down the positives that this machine will provide. This AR Blue Clean AR142P review must mention the built in accessory compartment. This keeps all things handy when they are needed. 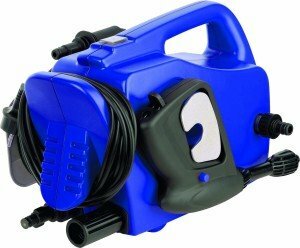 There is also a quick connect garden hose adapter with built in water filter and automatic water check valve as well. Many consumers raved about the brush attachment, especially while cleaning items like a deck. Despite the numerous pros that were discussed in this AR Blue Clean AR142P review, it is necessary to list some of the negatives that certain customers have uncovered. Some users experienced leakage through the hose connector. To correct the problem, it is simple to buy metal replacements at a local hardware store. Certain people felt that a stronger PSI was necessary. However, it has been stated here that the unit is meant to complete small tasks around the home. 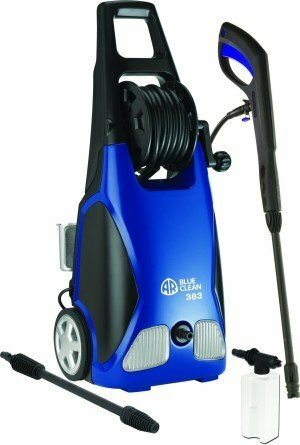 An AR Blue Clean AR142P review must discuss the way that the machine was rated by customers. This unit received four out of five stars, based on 27 customer reviews. Overall, many people found this unit to work as expected. Here we end with a recommendation to purchase this unit. 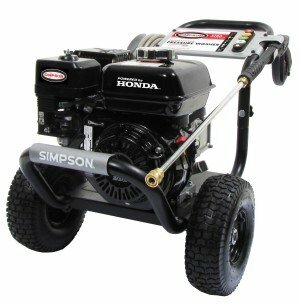 This pressure washer offers many positive features. It is an affordable way to finish large scale cleaning projects with ease. Since this review took an in depth look at this machine, there should be no doubt as to the benefits that it will bring.